Merlo launched in Italy in 1964 as a family business that specialised in the manufacture of farm machinery for sale. 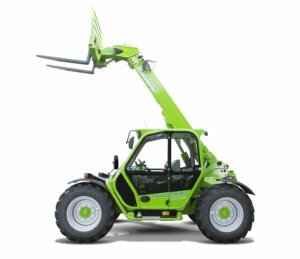 Merlo launched its first telehandler in 1981, which was a major turning point in the company’s history. Following decades of progress, Merlo is now world renowned for state-of-the-art agricultural machinery and construction machines. We have been selling and servicing Merlo’s as an official UK dealer here at East Cowton since 2013. 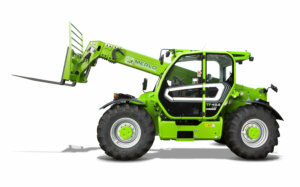 Please explore the Merlo range right here at BRM. Engineered to excel in confined spaces, the Compact telehandler range fits the bill. The models start at 1.84m in width by 1.92m in height, but still maintain the same comfortable cab design on larger telehandlers. Although compact in size it still packs a punch with a 40k transmission. The boom extends to 6 metres and can lift an impressive 2.7 tonnes. A load sensing system will enhance your telehandler performance and delivers superior efficiency. They are an ideal choice for construction or farming purposes because of their excellent visibility and high ground clearance. Merlo designed the cutting-edge Multifarmer with revolution in mind. By combining the versatility of a tractor with the strengths of an agricultural telehandler they have provided a unique solution. As a result the Multifarmer range has a three point linkage and rear PTO so can be used for many more tasks around the farm. This single piece of farm equipment seamlessly performs handling, lifting and transportation tasks. It can also be used for trailed and mounted farm machinery. The Multifarmer range has engine options up to 156hp and lift capacity of 4 tonnes. There are also many other features available that make this model one of the finest agricultural tools on the market. The Turbofarmer range has telehandlers that offer fantastic versatility across the range. Not only can they complete agricultural tasks with ease, but they have also been certified for towing trailers on the road up to 40 km/h. This was a Merlo first innovation. You can choose from different models based on their technical capabilities. These include capacities of 3,400kg to 5,000kg, 7- to 10-metre lift heights and turbo engines of 100hp to 156hp. 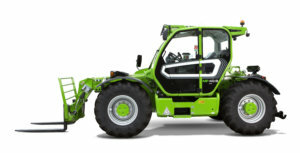 Find out more about Merlo telehandlers by talking to BRM today. Call us on 01325 378552 or email enquiries@brmltd.co.uk and we will figure out the best option for you.